Providing you the best range of e-burette with 3 calibrated pre - set speeds, 25 ml, e-burette with 3 calibrated pre - set speeds, 10 ml and e-burette with 3 calibrated pre - set speeds, 50 ml with effective & timely delivery. 1. Motor controlled piston enabling uniform movement of the piston with no abrupt speed changes as per the guidelines of ISO 8655. It eliminates the errors associated with manual wheel controlled piston movement. 2. Three pre-programmed dispensing speeds (fast, medium and drop-wise). Each speed is individually calibrated. 3. 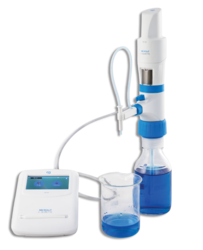 Drop-wise speed mode provides high control on dispensing. 4. Touch screen control panel helps in quick and accurate titrations. 5. Digital on-screen reading up to 2 decimal points. 6. Refilling is possible without any change in the onscreen reading, after the maximum volume is dispensed. 8. The instrument can store up to 20 results in its memory. 9. FlexiNozzle™ offers a high degree of flexibility in both the horizontal and vertical directions, facilitating easy dispensing in demanding laboratory conditions. • Hand held stylus which assists in performing touch screen operations. • Amber colored window that facilitates use with chemicals/reagents that are sensitive to light. • Inlet Tube and a Telescoping Tube that can be adjusted according to a variety of bottle sizes. • Pen Drive, Micro USB Cable, Charging Adapter & Power Cable.